Be transported back to Hollywood’s Golden Age on this 3-hour walking tour that will give you a behind-the-scenes peek at the stars’ favorite haunts. Sip select cocktails at old speakeasies, lounges and mobster hangouts. Feel the lore of Hollywood Boulevard come alive as your guide details stories of icons like Marilyn Monroe and Charlie Chaplin. Photograph the signature art deco decor and flashing neon lights as the boulevard becomes your stage for the evening. Your group will be limited to 12 people to ensure a personalized experience. Meet your guide on Hollywood Boulevard for this 3-hour walking tour of some of Los Angeles’ most historic sites. Get an inside look at some of the key places Hollywood’s biggest celebrities have frequented. 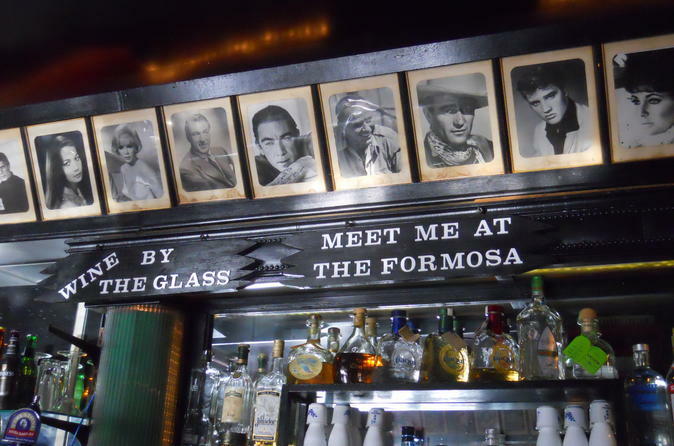 Sit in the booths once occupied by the likes of Marilyn Monroe and Charlie Chaplin. Set out on an early evening adventure to experience these iconic Hollywood haunts the way the stars did, and some still do. Stroll Hollywood Boulevard’s Walk of Fame and listen to your guide share stories about some of the film industry’s most influential actors, directors and writers. Duck into the bars that line the boulevard, where celebrities of Hollywood’s Golden Age would mingle and drink. Some of the places still make guest appearances in films and television shows. But you’ll also hear the inside scoop on lesser-known tales of mobster hangouts and a secret ‘Writer’s Room’ that still contribute to the ambience inside these historic walls. Your guide will take you behind the art deco façades and flickering neon lights to reveal the true stories of Hollywood (and you might even see a star or two). You’ll take part in select drink tastings along the way and stop to taste some street food along the way. Beyond bars, you’ll also see iconic buildings and get to know where the locals like to hang out, instead of getting stuck at the tourist traps. The tour concludes on Hollywood Boulevard outside the Roosevelt Hotel, which is a great place to continue mingling on your own with locals at the dramatic bar hotel that almost feels like a movie set. You never know whom you might bump into. Please note: Comfortable shoes for walking are recommended. All participants under 21 years of age will be served select nonalcoholic beverages instead. Children are not permitted on this tour.